THE 1970s and early 1980s ushered in a new era of information and angling literature about insect hatches and imitative fly patterns. As a teenager in southern Idaho, trying to figure out how to fool the rainbows of Silver Creek, Selective Trout became my bible for several summers. I collected and studied the classic bug books that followed: Hatches, Nymphs, The Caddis and the Angler, Caddisflies, Mayflies, The Angler and the Trout, Naturals, Whitlock’s Guide to Aquatic Trout Foods, and a number of others. 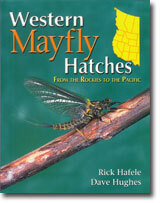 One book from this period that was especially helpful was The Complete Book of Western Hatches by Rick Hafele and Dave Hughes. As the name implies, it provided the Western angler a more complete reference by covering only the hatches of that region. The new book is well designed and beautifully printed, all in color — a grand improvement over the earlier work for students of insects and fly patterns. The book also benefits a great deal from the talents of two of the authors’ fishing friends — Jim Schollmeyer, who contributed the fly pattern photos, and Richard Bunse, who provided the insect illustrations. As a layperson with a serious interest in the bugs myself, I appreciate the accurate but measured entomological information. Each group of mayflies is described in detail with identifying characteristics of each stage of the insect matched to Bunse’s excellent illustrations. This allows accurate identification to a useful level, but the reader is not confronted by an information overload of taxonomic jargon. The taxonomic classification of mayflies has changed a great deal since many of the classic books of the 70s and 80s, and the authors of Western Mayfly Hatches bring the reader up to date, noting the correspondences between previous and current scientific names. This is especially helpful when cross-referencing information from older books. Even though the entomological information is thorough, this remains a book for anglers. The information on insect habitat and behavior is tied clearly and directly to suggestions of appropriate imitations (with photographs and tying recipes of each pattern) and to extensive discussions of presentation methods. Another very useful feature of the book is the ranking of the importance of each hatch. For each insect, the authors provide a table showing a matrix of criteria like the breadth of distribution, abundance of insects during a particular hatch, hatch timing, behavior that makes the insects more or less available to fish and anglers, and so on. On a practical level, anglers should first become familiar with the mayflies that are common throughout the region and hatch over long periods of the season, in daylight hours, etc. In contrast, one can choose to ignore the rare insects that hatch for only very brief periods, after dark, or in environments that harbor only warm water species. Other texts have tried to provide this information (Swisher and Richards’s concept of “superhatches” in Selective Trout comes to mind), but Western Mayfly Hatches‘ system is an excellent attempt to quantify it in a useful manner. From a journalistic perspective, I find the authors’ approach to a couple of issues very refreshing. The first is their honest attempt to give credit to originators of fly patterns. As a long-time commercial tier and a retail fly buyer, I have seen fly designs “borrowed,” renamed, remarketed, and sold with no attempt to attribute patterns to their creators. As the authors acknowledge, these are tricky seas to navigate, but at least they have taken this issue seriously, and I applaud their efforts. Also heartening is the authors’ journalistic integrity in acknowledging other sources of information. One of the strengths of the book is Hafele and Hughes’s extensive fishing experience over the hatches they describe, and they provide much useful anecdotal information (and interesting accounts of fishing) based on this experience. When their personal experience is lacking, they fill in gaps with information from other anglers and local experts from around the West, and they clearly note when they have done this. When they have relied on other written sources, they generally provide the bibliographic information on the spot. Western Mayfly Hatches has already taken up a place of honor at the side of my tying bench and will be a much-used reference in the years to come. Though a complete revision of 1981’s Western Hatches may have been too much for one book, Hafele and Hughes leave us wishing for just that, no matter how heavy the final work may feel in our hands.